Glendalough Sheela, Co. Wicklow, St Saviour's Church. Visited July 1999. On a gorgeous summer's day, my parents and I visited Glendalough and hiked into the woods and down a hill to the ruins of St. Saviour's Church. 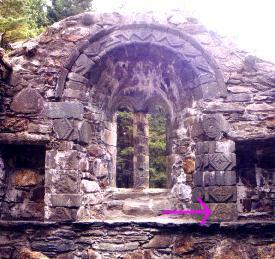 The church is about a half-mile from the visitor's center, but since it is in the opposite direction from the main attractions at Glendalough, it is possible to have the ruins of the church all to yourself, even in high tourist season. 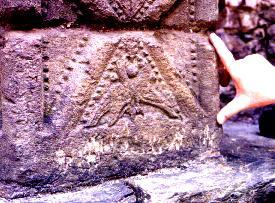 I have shown the entire window, as well as a closeup of the sheela (with my dad's wee hand for scale). She has a skull-shaped head, a fierce grimace, a round belly and wide legs that resemble a mermaid's fishy tail. 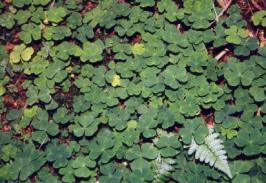 I'm also including a shot of the gorgeous shamrocks that litter the floor of the woods at Glendalough. My mom, herself an Irish native, was more enchanted by the shamrocks than by anything else we saw that day. She uses this picture as her screensaver. During your visit, be sure to take a few hours to tour the other historical sites at beautiful Glendalough.